While the golden age of romantic screwball comedy pictures by Capra ,Sturges , McCarey , Hawks , Cukor and others was a major exception, for the most part the genre has adhered to a structure not unlike most Disneyfied animated fairy tales where boy meets girl and the two live happily ever after. And in order to shake things up, misunderstandings and mistaken identities along with temporary breakups aka “boy loses girl then gets girl back” were added to the paradigm. Moving with the changing times to touch on issues of divorce, women in the workforce, family life, infidelity etc. ensured that one of Hollywood's longest genre love affairs wouldn't end thanks to a constant evolution of the onscreen romance. In fact, a few years ago, the structure was reconfigured altogether. Instead of “first comes love, then comes marriage, then comes the baby in the baby carriage,” movies about women in their late thirties opting to take an alternative path to fertility became all the rage following the success of Tina Fey and Amy Poehler's big screen sitcom-like play on Odd Couple adventures in surrogacy, Baby Mama . Yet after a few too many She's Having a Baby style movies wherein women either get accidentally or intentionally Knocked Up as part of some trendy Back-Up Plan , the charm of silly baby mama drama with a side of post-insemination boy meets girl fueled rom-coms had understandably worn off for potential ticket buyers. And in the case of the 2010 Jennifer Aniston vehicle The Switch from Blades of Glory directors Josh Gordon and Will Speck, it's a shame indeed that we'd developed morning sickness to the entire package altogether after suffering through not only J. Lo's horrifically dismal, similarly themed Back-up Plan but Aniston's terminally unfunny previous rom-com The Bounty Hunter as well. 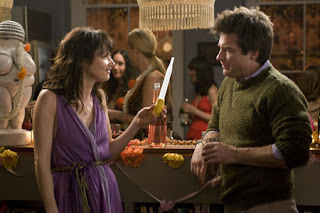 While the thinly veiled misogyny on display in a number of romantic comedy reviews written by the relative boys club of movie critics is always a factor, considering the badly timed release date, it's no wonder that by the time journalists survived the aforementioned duo of films, they were feeling even less charitable than usual when it came to The Switch . Yet after watching the film several months after enduring the litmus test of the others, I can't help but feel the scathing write-ups were entirely unjustified as it's honestly the best entry in the "guess who's taken it upon themselves to make a baby" subgenre so far. A decidedly un-Disneyfied offering from the Disney owned Miramax, the directors keep us invested against all odds. 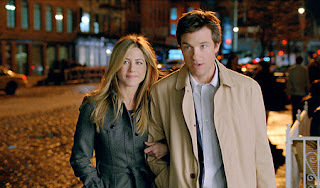 And the success of The Switch is all the more impressive when you realize just how easily the film's admittedly twisted premise that finds the artificial insemination of Aniston's Kassie taking a creepy turn for the strange could've turned audience stomachs as well as our sympathy for Jason Bateman's male protagonist. Fighting the urge to yuk it up with over-the-top performances, extreme sight gags and a broad style to try to jolt us into a false sense of hysterics over the titular “switch,” everything is handled with a strong sense of matter-of-fact realism – despite the bizarre twist – as well as a surprising amount of pathos, sweetness and a warm generosity of spirit. Although the casting of Bateman alone signals a sharp departure from the overall theme of a homely man in hopeless and unrequited love with his gorgeous female best friend as evidenced in the original source material of Middlesex and Virgin Suicides author Jeffrey Eugenidies's New Yorker story Baster, Bateman's tender turn as a hypochondriacal neurotic transcends his surface level attractiveness. However, in stark contrast to Bateman's completely fleshed out character Wally, Aniston's role as an intelligent, compassionate and sophisticated woman who can't seem to recognize two obvious truths until very late into the film suffers from a more one-dimensional treatment in Allan Loeb's otherwise enviably poignant script. Nonetheless despite a few conventional genre contrivances, the thing that sets Switch apart from the rest of the pack is its willingness to embrace bittersweet counterpoints by finding new ways to bring the unavoidable, requisite scenes of evolving attraction to life. Whereas in the hands of the Adam McKay or Judd Apatow, any scene involving a child with head lice would've been gross-out gag gold but as we watch Wally calmly and lovingly tend to Kassie's hopelessly neurotic young son, we can't help but be as moved as Kassie is when she sees the two people she loves most bonding. To this end, it's slightly reminiscent of Aniston's earlier unorthodox -- anything goes politically correct faux romantic dramedy Object of My Affection -- in terms of the way it invokes genuine sincerity to handle what would otherwise have been truly ludicrous turns of events. Likewise, even though The Switch doesn't challenge Aniston as much as her acclaimed indie performances in Friends with Money or The Good Girl and we wish that as a producer, she'd develop better projects to illustrate her range, this is the type of role she can easily knock out of the park. Given a high quality transfer to Lionsgate Blu-ray, the co-Miramax production offers a wildly different alternate ending that could've changed the direction of the entire movie (in my eyes for the worse) as well as behind-the-scenes bonus features including Bloopers, more deleted scenes with filmmaker introductions, and a making-of-featurette. A decidedly daring romantic comedy involving a impulsive switch of desperation to back-up the back-up plan for Aniston's would-be knocked up baby mama -- what could've simply evolved into an unsentimental tale of insemination is elevated by an intelligent script, assured direction and a solid cast including terrific supporting performances by MVPs Juliette Lewis, Patrick Wilson and Jeff Goldblum.